With the NFL season drawing to a close, fantasy teams have battled it out, playoffs have passed and we’re ready to watch Super Bowl 50 between the Broncos and Carolina Panthers. Football fandom ranges from the interested home viewer to the tailgating professional, and in the spirit of football season, the team at MooseRoots wanted to see which first names are most common among NFL players. 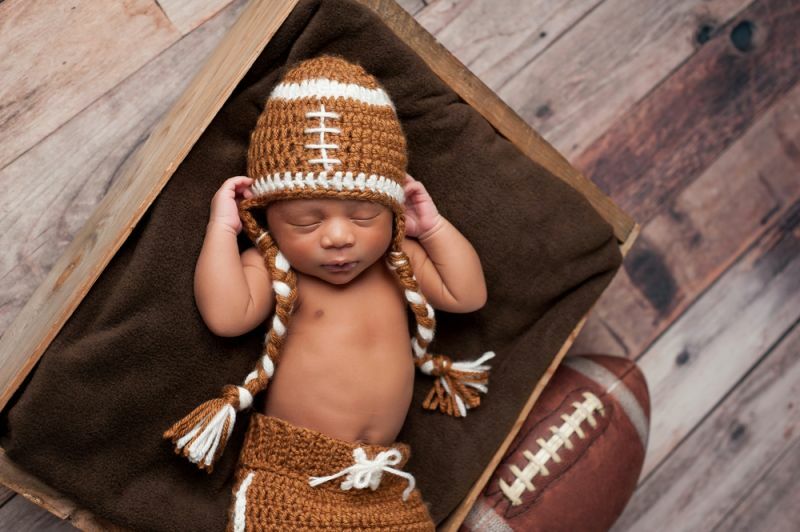 Those who really love the sport can consider naming their children after favorite players as homage or with the hopes of raising a future star of their own. To identify the most common NFL names, we gathered the 2,850 names of players in the season. We then grouped by first name to get the count. Considering the average age of current NFL players is 25, we looked at how each name ranked in 1990 to see whether some names are more popular among NFL players than the general population. Some featured names, like Michael and Justin, were popular in the early 1990s. Other names, like Andre, were not popular that decade, but rank highly among NFL players. Does naming your baby boy Andre increase his draft chances? We’ll let you decide. Cameron is a popular male name with English and Scottish origin. The name has held steady in popularity for the last decade, and was the 53rd most common name for baby boys in 2014. Funny enough, Cameron means “crooked nose” which is quite likely to happen if your little guy is playing the field. Short and powerful, Alex means “defender of men.” Hopefully naming your boy Alex will ensure him excellent defensive line skills. While Alexander is a popular name, Alex as an independent name ranked lower, as the 128th most popular name for baby males in the U.S. in 2014. Jonathon is another popular name that originates from the Bible. It means “God has given,” and in 2014 it ranked No. 44, meaning 8,035 U.S. baby males were named Jonathon. While Andre was not a popular name in the ’90s, it is a popular name among NFL players. This French name, which means “brave” and “manly,” ranked No. 283 in popularity in the U.S. in 2014. Tony is a good name choice if you want your little one to become a “praiseworthy” football star, since that is what it means. As a standalone name, Tony is trending slowly down in popularity. In 2014, it had a rank of 448 for all male newborns in the U.S.
Sean is the Irish equivalent to John, though it doesn’t hold the same rank of popularity. In 2014, 2,107 U.S. baby boys were named Sean, giving the name a rank of 193. Sean is a more popular in Ireland where it was the fifth most popular baby boy name in 2014. Jeremy is a popular anglicized form of the biblical name Jeremiah. The name means “may Jehovah exalt,” and has dropped significantly in popularity over the last decade. In 2014, Jeremy was the 169th most popular male name in the U.S., with 6,780 newborns sharing the name. Since the mid-1980s, Ben has been a popular independent name. In 2014, 329 U.S. male newborns were named Ben, giving the name a rank of 723. Other countries are breathing life back into this short name. It was the seventh most popular male name in Germany in 2014. While more popular as a short name for William, this baby name was once very popular, in 1882, when it ranked No. 25. In 2014, the name was trending down in popularity and held a much less impressive rank of 763 in the U.S.
Jason is a common male name of English and Greek origin. In 2014, an impressive 5,510 baby boys were named Jason in the U.S., ranking the name at No. 75. Starting off as a popular surname, Tyler raised to its peak popularity in 1994 when it achieved a rank of No. 5. Twenty years later, in 2014, the name has fallen to the 72nd spot in the U.S.
Corey, which is a Gaelic name meaning “ravine,” is a common African-American and Black-British name. In the U.S. the name trends significantly down in popularity, while holding more steady in Scotland and Northern Ireland. In 2014, it had a rank of 387 for all American male newborns. Zach, as a standalone name, is unusual in the U.S., ranking No. 2,083 for all male newborns. The full counterpart, Zachary, ranked No. 22 in 1990. However, Zach is rising in popularity in other countries, and ranked No. 69 in Northern Ireland in 2014. Andrew originates from the Greek name Andreas, which means “man warrior.” An appropriate name for any football player wanting to lead his team to victory. Ranked high at No. 22 in 2014 for U.S. baby names, Andrew is trending down in popularity. Kyle is a Scottish name that is now widely used in the U.S. The name means “narrow” or “strait” and was the 178th most popular baby boy name in the U.S. in 2014. Originally a short form of Joseph, Joe became a favored independent name in the ’90s. While the name did not rank high that decade, it does rank high among NFL players, with 18 notable players sharing the name. In 2014, Joe was the 565th most popular male baby name in the U.S., and continues to trend down in popularity. Italian name, Anthony, holds steadily as the 21st most popular male baby name in the U.S. in 2014. The name was even more popular in 2007 when it reached a rank of seven. Robert is a strong name that means “famous.” Don’t be surprised if your baby boy becomes famous either on the football field or in another career. Robert was most famous in the 1920s when it ranked No. 1. In 2014, the name was not as popular, ranking 61st among baby boys in the U.S.
Kevin is the Anglicized form of the Gaelic name Caoimhín. In 2014, it was the 70th most popular name for American baby boys. John is not just a popular name among NFL players. Several historical figures, such as saints, popes, royals and presidents have also been named John. In 2014, the name still remained a popular choice for baby boys, ranking No. 26 in the U.S.
Brian is an Old Celtic name meaning “noble.” The name has always ranked higher in Ireland, but Brian did see its peak popularity in the United States in the ’70s with an average ranking of eight. The name has trended down significantly, resulting in a rank of 168 in 2014. Nick is the shortened form of the popular male name Nicholas. As a standalone name, it ranked No. 1,182 in the U.S. in 2014 with only 156 baby boys named Nick that year. This New Testament name has held its rank for many decades. James, which means “supplanter” was the ninth most popular name for boys in the U.S. in 2014. The name holds a high ranking in other countries too. In 2014, James ranked No. 2 in Ireland, Scotland and Northern Ireland. Eric is an Old Norse name that was introduced into Britain by Scandinavian settlers. The name ranked No. 123 in the U.S., but held a significantly higher rank of 31 in Spain in 2014. Marcus is the original Latin form of Mark, and it has seen a steady decline in popularity over the last decade. It had an average rank of 64 during the 1980s, but dropped to No. 154 in 2014, with just 2,592 baby boys named Marcus. Justin comes from English origin, and was most popular during the 1980s when it had an average rank of 11. It has been trending slowly down in the U.S. over the last decade, and ranked No. 96 for baby boys born in 2014. Michael was the most popular male baby name in the ’90s, so it makes sense that quite a few NFL players share the name. The name means “who is like God?” and has seen a slow decline in popularity in the last decade. Despite trending down in ranking, the name was still the seventh most popular baby boy name in 2014. Jordan is a popular baby boy name that originates from Hebrew and means “flow down.” In 2014, it was the 55th most popular name in the U.S. for male newborns. Don’t let Matt’s low rank of 2,206 fool you. The name has been trending up as a standalone name over the last decade. Like the name Mike but aren’t a huge fan of Michael? You are not alone. In 2014, 215 baby boys were named Mike in the U.S., giving the name a rank of 970. Meaning “little king”, it is no wonder why Ryans dominate the football field. The name held its highest rank, at No. 11, in 1986. As of 2014, the name is still the 37th most popular male name in the U.S.
Americans use Josh as a shortened form of Joshua, but the name is growing in popularity in Britain as a standalone name. While the name ranked No. 1,148 in the U.S. in 2014, the name has made the top 200 lists in Ireland, Scotland and Northern Ireland in 2014. Originally used as a surname, Brandon is an Old English name that translates as “broom hill.” In 2014, it ranked No. 71 in the U.S. and No. 73 in New Zealand. Chris is a short form for Christopher that is sometimes used as a standalone boy name. In 1966, it was the 55th most common male baby name in the U.S. The name ranked No. 514 in 2014.